Our client of the month for September 2016 is Flora Estrada Amador, a hard-working, kind-hearted woman from Honduras who waited over 20 years to become a permanent resident (“green card” holder) of the United States. Flora first came to the United States in the mid-90s as an A-3 personal employee of a diplomat. She then received Temporary Protected Status (“TPS”) for Hondurans in 1999 and left her position with the diplomatic family. Flora then maintained her valid TPS for 17 years, until she was granted permanent resident status. While in valid TPS, Flora focused on working hard and contributing to American society. She started working for a family as a live-in home worker, taking care of the family’s home and helping raise their children. With her dedication and loving nature, Flora quickly became an important part of the family and they could not envision their family without her. The family decided to petition for Flora to become a permanent resident so she could live permanently in the United States. They filed a labor certification application on Flora’s behalf as her employer in 2009 and, following its approval, filed an I-140 employment-based “green card” petition on her behalf. Flora’s petition was approved in December of 2010, but since Flora’s petition fell within the “other workers” 3rd preference category for employment-based visas, there was a long waiting line until she could apply for her green card. The U.S. employment-based immigration system is based on the type of job and the skills and qualifications required to do that job. Each petition is categorized based on those skills and qualifications and there are a limited number of visas or “green cards” available in each preference category each year. This has created long waiting lines for visas; even if someone meets all of the necessary qualifications, they have to wait until their turn in the waiting line before they can actually file their application to adjust status (“green card” application). Flora waited over three years before it was her turn in the waiting line. Finally, in January of 2014, it was Flora’s turn in the waiting line for a visa. She filed her green card application and anxiously awaited the decision. Unfortunately, however, U.S. Citizenship and Immigration Services kept making mistake after mistake in the processing of her application – sending her file to the wrong location, asking for additional evidence that had already been submitted, delaying issuance of her TPS work permit and travel document, and many more. With mistakes like this being so common, it is hard to imagine how anyone could navigate our broken immigration system alone. 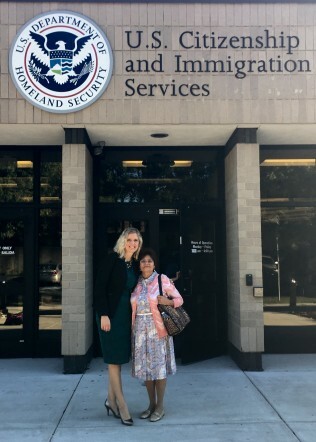 Thankfully, with our help and zealous advocacy, Flora finally was scheduled for her green card interview this September, and her application was granted on the spot. We are so happy for Flora and her employer. She can now continue her important work for this family and truly become a permanent part of our country. While no one who meets the qualifications for a green card should ever have to wait nearly eight years to complete the process, it was certainly worth the wait. Welcome Flora – the United States is lucky to have you!